Dr. George C. Banks (PhD, Virginia Commonwealth University) is an associate professor in the department of management within the Belk College of Business at UNC Charlotte. 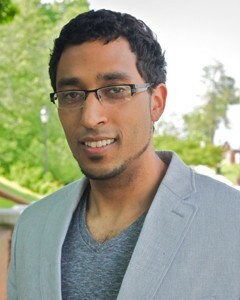 He is also a faculty member of the Organizational Science program (http://orgscience.uncc.edu/). Dr. Banks has more than 30 publications, including journal articles in top-tier outlets, such as Science, Academy of Management Journal, Journal of Management, and Journal of Applied Psychology. He was the recipient of the 2017 Sage Publications/CARMA Early Career Award from the Research Methods Division of the Academy of Management. His work has been featured by popular media outlets, such as the New York Times, the Wall Street Journal, The Guardian, as well as National Public Radio (NPR). Dr. Banks currently serves as a senior associate editor at The Leadership Quarterly and is on the editorial boards at Organizational Research Methods, Journal of Business and Psychology, and Human Resource Management Review. Prior to becoming an academic, Dr. Banks worked as a consultant for HRinterax, Inc. (Shelton, CT) and Human Technology, Inc. (McLean, VA). He has provided services for diverse clients, such as the Missile Defense Agency, the Forest Service, the Transportation Security Administration, the Patent and Trade Office, as well as the Foreign Agriculture Service. Heggestad, E., Scheaf, D., Banks, G. C., Hausfeld, M.M., Tonidandel, S., Williams, E. (in press). Scale adaptation in organizational science research: A review and best-practice recommendations. Journal of Management. O’Boyle, E. H., Banks, G. C., Carter, K., Walter, S., & Yuan, Z. (in press).A 20-year review of outcome reporting bias in moderated multiple regression. Journal of Business and Psychology. Banks, G. C., Field, J. G., Oswald, F. L., O’Boyle, E. H., Landis, R. S., Rupp, D. E., Rogelberg, S. G. (in press). Answers to 18 questions about open science practices. Journal of Business and Psychology. Banks, G. C., Woznyj, H. M., Wesslen, R., Frear, K., Berka, G., Heggestad, E. & Gordon, H. (in press). Strategic recruitment across borders: An investigation of multinational enterprises. Journal of Management, 45, 476-509. Antonakis, J., Banks, G.C., Bastardoz, N., Cole, M. S., Day, D. V. (2019). The Leadership Quarterly: State of the journal. The Leadership Quarterly, 30, 1-9. (Editorial). Woznyj, H. M., Grenier, K., Ross, R., Banks, G. C., & Rogelberg, S. G. (2018). An investigation into the effectiveness of results blind reviews. European Journal of Work and Organizational Psychology, 27, 561-576. Hardwicke, T. E., Mathur, M., MacDonald, K., Nilsonne, G., Banks, G. C., Kidwell, M. C., . . . Tessler, M. H. (2018). Data availability, reusability, and analytic reproducibility: Evaluating the impact of a mandatory open data policy at the journal Cognition. Royal Society Open Science, 5. Banks, G. C., Woznyj, H. M., Kepes, S., Batchelor, J. H., & McDaniel, M. A. (2018). A meta-analytic review of tipping compensation practices: An agency theory perspective. Personnel Psychology, 71, 457-478. Grand, J. A., Rogelberg, S. G., Banks, G. C., Landis, R. S., Tonidandel, S. (2018). From outcome to process focus: Fostering a more robust psychological science through registered reports and results-blind reviewing. Perspectives on Psychological Science, 13, 448-456. Banks, G. C., Gooty, J., Ross, R., Wiliams, C., & Harrison, N. (2018). Construct redundancy in leader behaviors: A review and agenda for the future. The Leadership Quarterly, 29, 236-251. Banks, G. C., †Engemann, K. E., †Williams, C. E., Gooty, J., Davis McCauley, K., & Medaugh, M. (2017). A meta-analytic review and future research agenda of charismatic leadership. The Leadership Quarterly, 28, 508-529. †indicates equal contributor. Harrison, J. S., Banks, G. C., Pollack, J. M., O’Boyle Jr., E. H., & Short, J. C. (2017). Publication bias in strategic management research. Journal of Management, 43, 376-399. O’Boyle Jr., E.H., Banks, G.C., Gonzalez-Mule, E. (2017). The chrysalis effect: How ugly data metamorphosize into beautiful articles. Journal of Management, 43, 400-425. Banks, G. C., Pollack, J. M., Bochantin, J. E., Kirkman, B. L., Whelpley, C. E., & O’Boyle, E. H., (2016). Management’s science practice gap: A grand challenge for all stakeholders. Academy of Management Journal, 59, 2205-2231. Banks, G. C., Rogelberg, S. G., Woznyj, H. M., Landis, R. S., & Rupp, D. E. (2016). Evidence on questionable research practices: The good, the bad, and the ugly. Journal of Business and Psychology, 31, 323-338. Banks, G. C., Davis McCauley, K., Gardner, W. L., & Guler, C. E. (2016). A meta-analytic review of authentic and transformational leadership: A test for redundancy. The Leadership Quarterly, 27, 634-652. Banks, G. C., Pollack, J. H., Seers, A. (2016). Team coordination and organizational routines: Bottoms up-and top down. Management Decisions, 54, 1059-1072. Banks, G. C., O’Boyle, E. H., Pollack, J. M., White, C. D., Batchelor, J. H., et al. (2016). Questions about questionable research practices in the field of management: A guest commentary. Journal of Management, 42, 5-20. Banks, G. C., Kepes, S., Joshi, M. & Seers, A. (2016). Social identity and applicant attraction: Exploring the roles of multiple levels of self. Journal of Organizational Behavior, 37, 326-345. Banks, G. C. & Whelpley, C. E. (2016). Registered reports publication model. In S. G. Rogelberg (Ed). The SAGE Encyclopedia of Industrial and Organizational Psychology (2nd edition). Thousand Oaks, CA: Sage. Nosek, B. A., Alter, G., Banks, G. C., Borsboom, D., Bowman, S. D., et al. (2015). Promoting an open research culture. Science, 348, 1422-1425. Banks, G. C. & Kepes, S. (2015). The influence of strategic HRM activities on performance-related outcomes: Exploring the dynamics within the “black box.” Human Resource Management Review, 35, 352-367. O’Boyle, Jr., E. H., Forsyth, D. R. Banks, G. C., White, C. & Story, P. A. (2015). A meta-analytic test of redundancy and relative importance of the Dark Triad and five factor model of personality. Journal of Personality, 83, 644-664. Thundiyil, T. G., Chiaburu, D. S., Oh, I.-S., Banks, G. C., Peng, A. C. (2015). Cynical about change? A preliminary meta-analysis and future research agenda. The Journal of Applied Behavioral Science, 51, 429-450. Banks, G.C., Kepes, S., McDaniel, M.A. (2015). Publication bias: Understanding the myths concerning threats to the advancement of science. In C. E. Lance & R. J. Vandenberg (Eds. ), Statistical and methodological myths and urban legends: Doctrine, verity, and fable in organizational and social sciences. New York, NY: Routledge. Banks, G.C., Batchelor, J.H., Seers, A., O’Boyle Jr., E., Pollack, J., & Gower, K. (2014). What does team-member exchange bring to the party? A meta-analytic review of team and leader social exchange. Journal of Organizational Behavior, 35, 273–295. O’Boyle Jr., E.H., Rutherford, M. & Banks, G.C. (2014). Publication bias in entrepreneurship research: An examination of dominant relations to performance. Journal of Business Venturing, 29,773-784. Chiaburu, D.S., Peng, A.C., Oh, I.-S., Banks, G.C., & Lomeli, L.C. (2013). Employee organizational cynicism antecedents and outcomes: A meta-analysis. Journal of Vocational Behavior, 83, 181-197. O’Boyle Jr., E.H., Forsyth, D.R., Banks, G.C., & Story, P.A. (2013). A meta-analytic review of the dark-triad-intelligence connection Journal of Research in Personality, 47, 789-794. †Banks, G.C. & †O’Boyle Jr., E.H. (2013). Why we need I-O psychology to fix I-O psychology. Industrial and Organizational Psychology: Perspectives on Science and Practice, 6, 291-294. †indicates equal contributor. Kepes, S., McDaniel, M.A., Brannick, M.T., & Banks, G.C. (2013). Meta-analytic reviews in the organizational sciences: Two meta-analytic schools on the way to MARS. Journal of Business and Psychology, 28, 123-142. †Banks, G.C., †Whelpley, C., Oh, I.-S., & Shin, K. (2012). (How) Are emotionally exhausted employees harmful? International Journal of Stress Management, 19, 198-216. †indicates equal contributor. O’Boyle Jr., E., Forsyth, D.R., Banks, G.C., & McDaniel, M.A. (2012). A meta-analysis of the dark triad and work behaviors: A social exchange perspective. Journal of Applied Psychology, 97, 557-579. Kepes, S., Banks, G.C., & McDaniel, M.A., & Whetzel, D.L. (2012). Publication bias in the organizational sciences. Organizational Research Methods, 15, 624-662. Banks, G.C., Kepes, S., & Banks, K.P. (2012). Publication bias: The antagonist of meta-analytic reviews and effective policy making. Educational Evaluation and Policy Analysis, 34, 259-277. Kepes, S., Banks, G.C., & Oh, I-S. (2012). Avoiding bias in publication bias research: The value of null findings. Journal of Business and Psychology. Banks, G.C. & McDaniel, M.A. (2012). Meta-analyses and selection procedures. In N. Schmitt (Eds. ), The Oxford Handbook of Personnel Assessment and Selection (pp. 156-175). Oxford: Oxford University Press. McDaniel, M.A., Pesta, B.J., & Banks, G.C. (2012). Job performance and the older worker. In J. Hedge and W. Borman (Eds.) Oxford Handbook of Work and Aging (pp. 280-297). Oxford: Oxford University Press. McDaniel, M.A., Kepes, S., & Banks, G.C. (2011). Encouraging debate on the uniform guidelines and the disparate impact theory of discrimination. Industrial and Organizational Psychology: Perspectives on Science and Practice, 4, 566-570. McDaniel, M.A., Kepes, S., & Banks, G.C. (2011). The uniform guidelines are a detriment to the field of personnel selection. Industrial and Organizational Psychology: Perspectives on Science and Practice, 4, 494-514. Banks, G.C., Batchelor, J.H., & McDaniel, M.A. (2010). Smarter people are (a bit) more symmetrical: A meta-analysis of the relationship between intelligence and fluctuating asymmetry. Intelligence, 38, 393-401. McDaniel, M.A. & Banks, G.C. (2010). General cognitive ability. In J. Scott and D. Reynolds (Eds.) The Handbook of Workplace Assessment: Selecting and Developing Organizational Talent (pp. 61-80). Hoboken, NJ: Wiley.